Love is in the air! It's not quite February yet, but it's never too early to start thinking about Valentine's Day decorations! 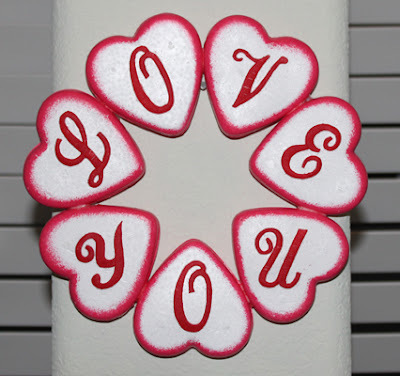 Here's a fun wreath to say "Love You" without lettering stress! 1. 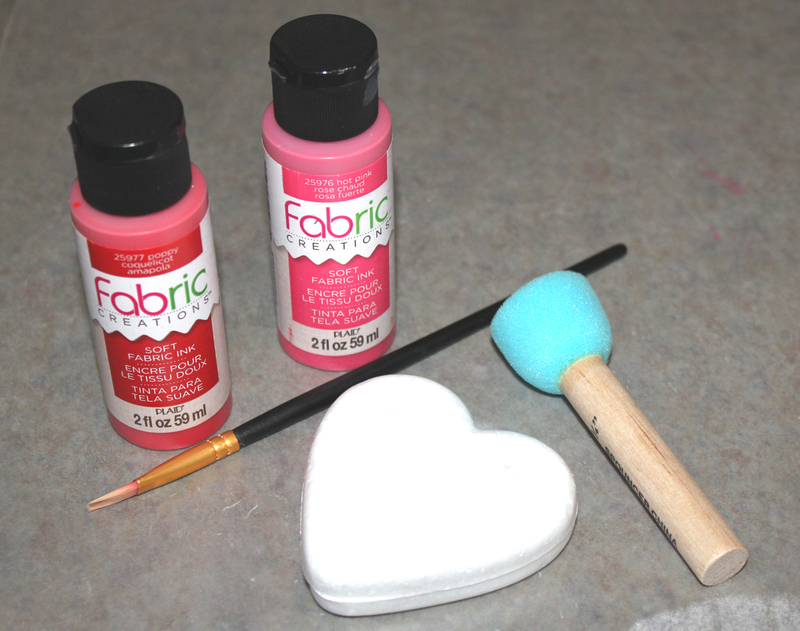 Using the sponge applicator dab, pink paint around the edge of each heart. Overlap the top edge to create the feathered look on the front. Let dry. TIP: You can use any kind of paint on the hearts, but since I was using fabric paint for the letters, I thought I'd try it on the hearts too. I love the look! It dries to a shiny finish and, although it feels a little tacky to the touch, it isn't tacky at all! 2. Place the letters on wax paper, then paint red. Paint in the same direction as the threads. Use a toothpick to move the letters to a clean surface to dry. 3. When dry, glue the letters to the hearts. TIP: Spread a thin layer of tacky glue onto the wax paper. Press each letter into the glue, lift off with a toothpick then position on the heart. 4. Create a ring with the hearts as shown. Glue together where the hearts touch. - Paint the half-ball yellow then add heart stickers for eyes. Draw a smile with a black marker. 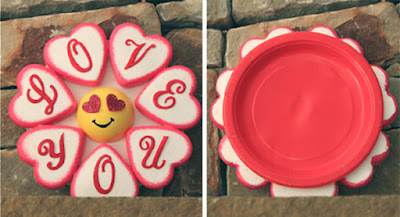 - Glue the back of a paper plate to the back of the hearts, flip over then glue the half-ball at the center. 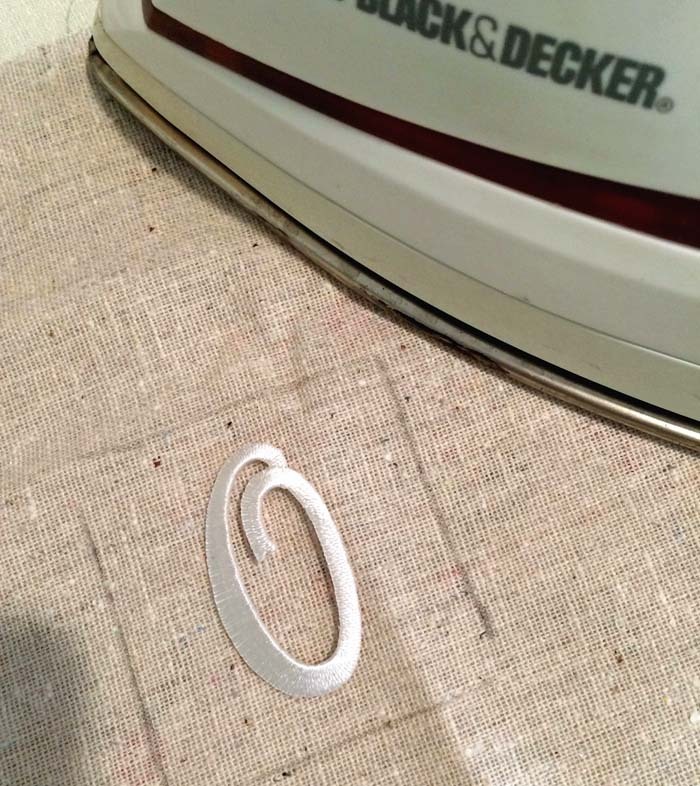 Punch holes at the top edge of the plate for a ribbon hanger if desired. Enjoy! Joy Iron-on letters can be found at your favorite craft store! In just a few weeks, it will be Valentine's Day. The holiday comes and goes so fast that I find myself in a rush to get everything done before February even gets here! Having just taken down the Christmas decorations, I had an empty spot on the mantle and decided to fill it with a collage of four 6" altered canvases to commemorate the month of LOVE. 1. Lay out canvas squares; choose and arrange the papers and embellishments as desired. 2. Working on one canvas at a time, cover the canvas surface with gesso and press white tissue paper into the gesso, leaving the surface a little bumpy. Trim off excess tissue paper. Allow to dry. 3. Ink the edges of each paper square. Glue a square to the first canvas and adhere the embellishments. Repeat for each canvas; rotating the patterned papers. TIP: Before you go out to purchase new supplies, check out what you have in your stash. 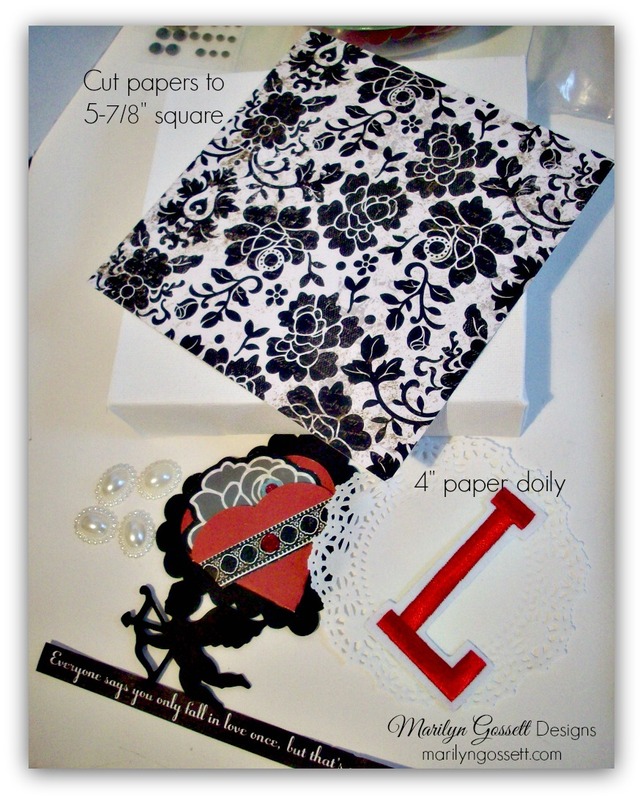 I like the black and white contrast, and as long as you stick with those two colors, any papers and embellishments will look great together! 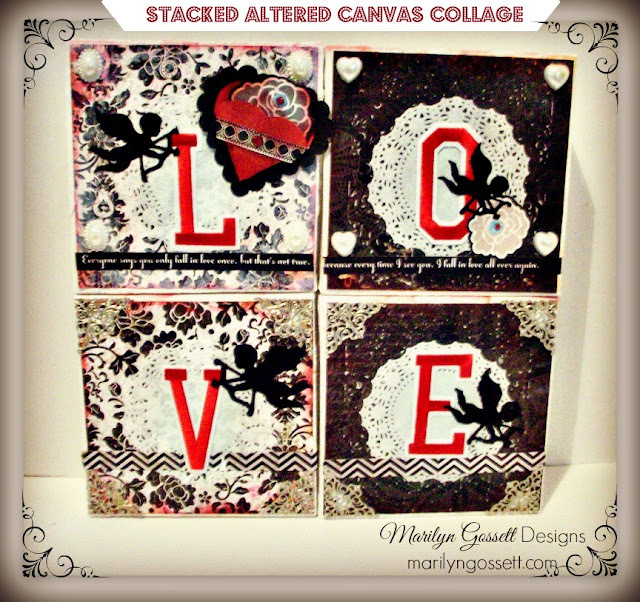 Below is another way to display your canvas collage. They can be stacked as shown or hung on the wall in this configuration. Do what works best for your decor! 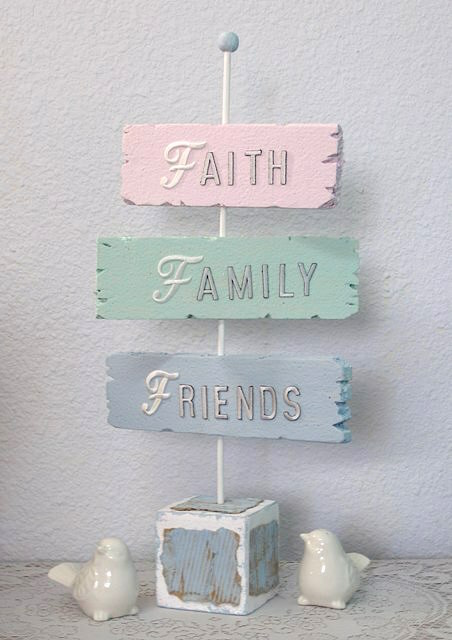 Use Joy letters to create an adorable shabby chic signpost that tells everyone what you treasure the most. Click here for the full tutorial from Terry Ricioli on the Smoothfoam blog. 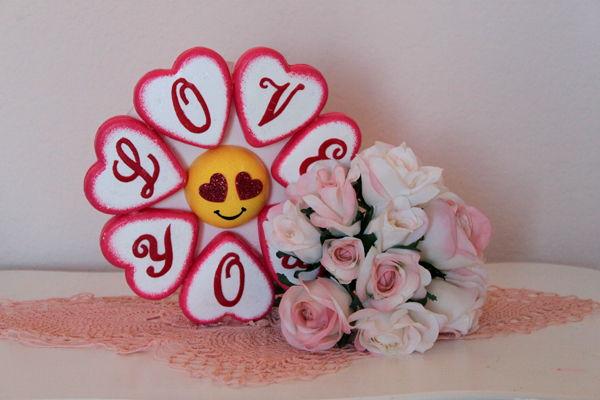 Hey there crafters - so who is ready for Valentine's Day? Valentines aren't just for your significant others, they can be for your kids and little loves as well! 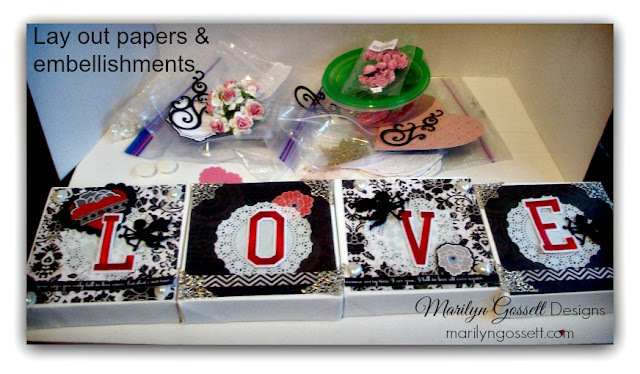 Here is a sweet and easy mixed media photo holder to incorporate a little love into your everyday décor with JOY letters. I started with this paper maché heart (mine is recycled but you can get a new one at a craft store) and added a little gesso and texture paste with stencils. Then I painted the heart with different variations of red. Once dry, I glued on a little clothespin and the letters. You can add several clothespins or just one for the loves in your life! I like the idea of having art blocks displayed in my studio - not only as inspiration to keep making art, but also as a display of some of the various materials and techniques I enjoy working with - such as handmade papers, opaque white stamp ink, molding paste, and pastel pigment powders. After sanding back the sharp corners of a trio of Smoothfoam cubes, I painted them all with a coffee shade. 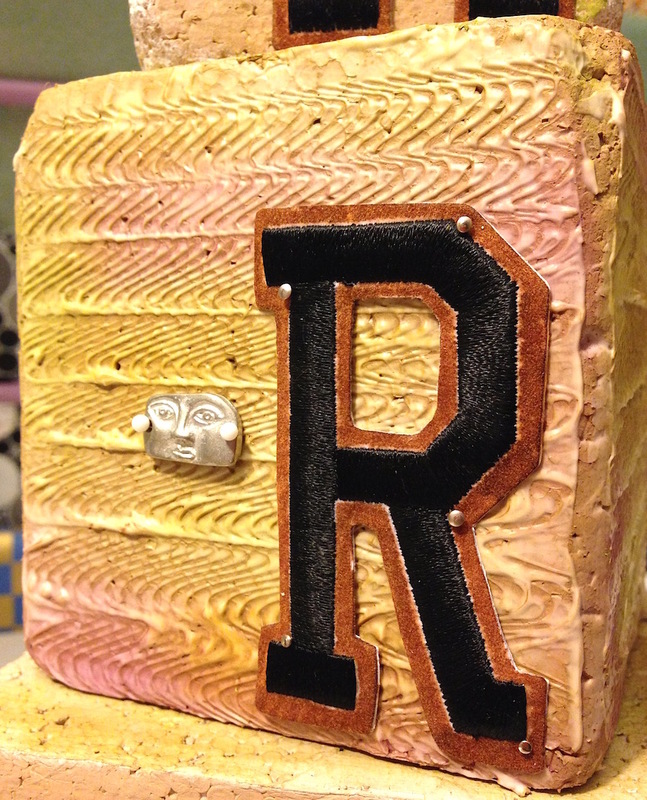 To tone back the bright white of the felt trim on my Joy embroidered letters, I colored the edges with a paint marker. I like using Smoothfoam blocks (rather than wood or cardboard) as a foundation because I can easily pin my letters in place and change the sentiment whenever I want. I also wanted to use these art blocks as a way to pin and display a few of my favorite charms and embellishments. 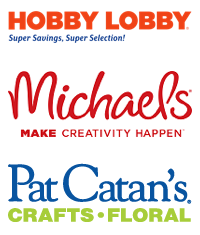 Look for JOY iron-on embroidered letters at your favorite craft store! As a gift for my hubs this year, I created this mini Valentine canvas using Joy Embroidered Letters. This little project was so easy and fun to make! I started by spraying a mini canvas with silver ink and heat drying. Then I colored a jar shape (diecut from mat board) red and beige with two ink pads, adding some highlights with a black pen. After adhering the jar to the canvas with foam tape, I inserted a spray of mini flowers & leaves behind the vase. Lastly, I added a few more flowers to the canvas and glued on my Joy embroidered letters with fabric adhesive. I'm excited to be one of the new design team members for the Creating with Joy blog! I'm so happy to be here and share my project ideas for Joy letters. 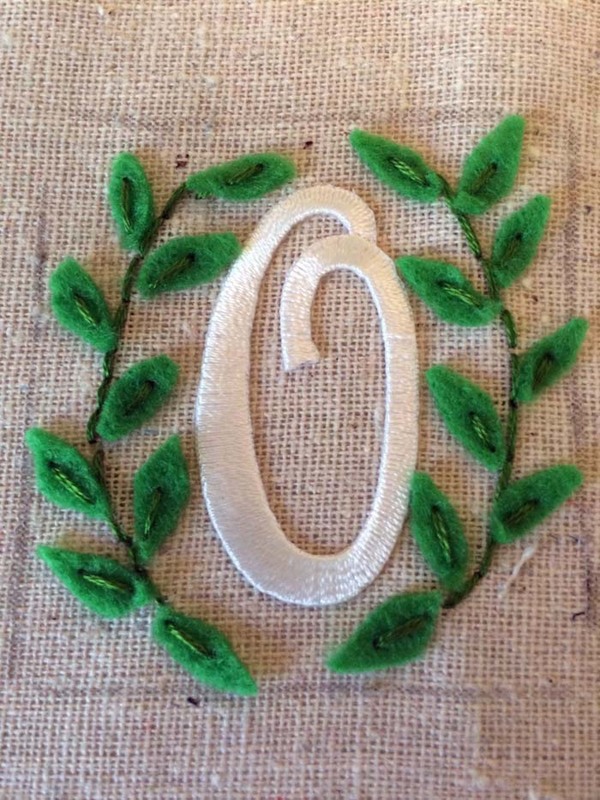 I love to embroider, but I'm an impatient crafter and get really bored if I have to satin stitch an entire monogram, so Joy letters are the perfect "cheat" item for someone like me. I can just iron-on the letter, embroider some pretty embellishments around it and I'm done! This cute framed floral monogram took me less than an hour to make! 1. Mark your frame size on your piece of linen. Center your monogram and iron-on. 2. Embroider vines around the sides of the monogram, then attach small felt leaves to the vines with a straight stitch. 3. 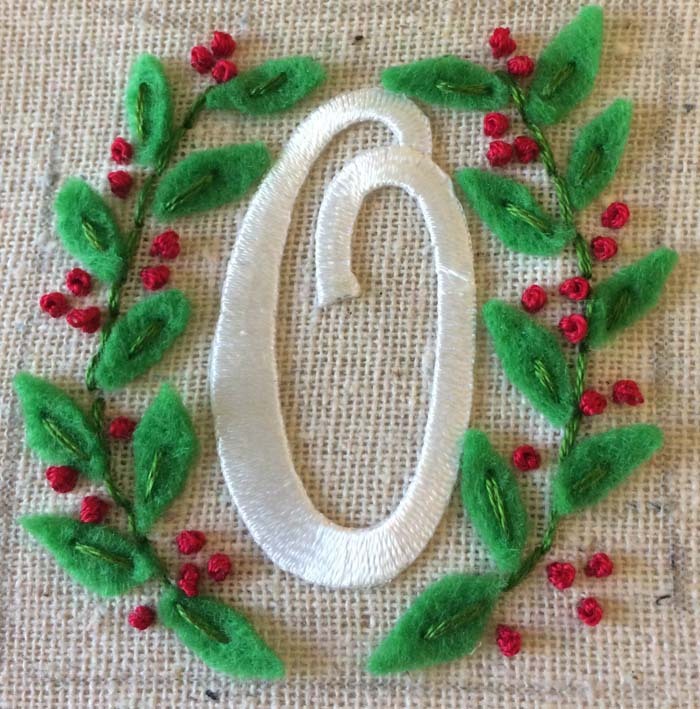 Embroider french knots for berries/flower buds around the leaves and vines. 4. Once you are happy with the design, cut out the embroidered area from the linen and slip it into your frame. Start your New Year off right with this cheerful and motivating wallhanging. 1. Paint canvas in your choice of colors. 2. 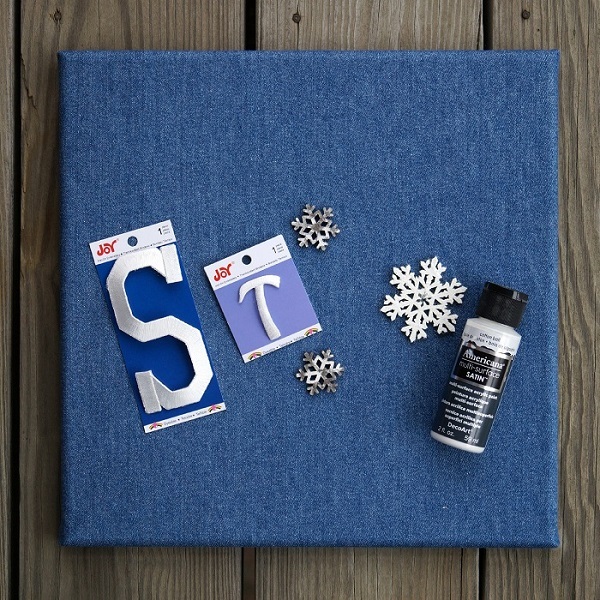 Carefully remove letters from backing and arrange on canvas. 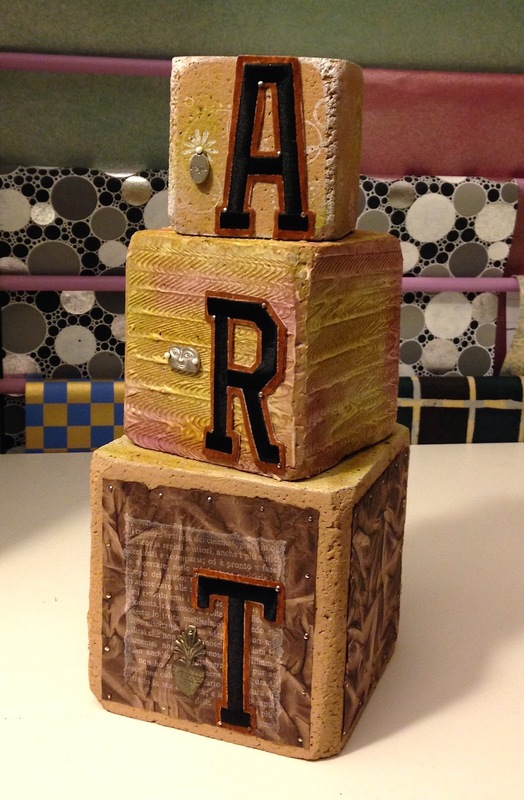 Apply tacky glue to backs of letters with a toothpick and glue to canvas. 3. Thread floss through buttons and glue to the centers of flowers, then glue to the canvas. 4. 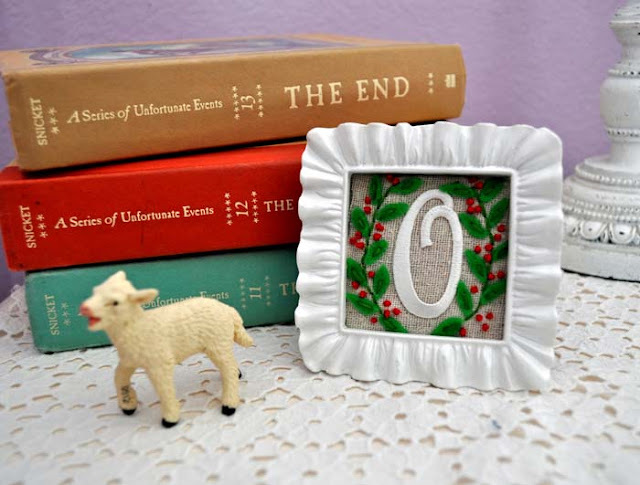 Add a picture hanger to the back and enjoy! Tween and teen girls can often be hard to buy gifts for, but with JOY embroidered letters, you can turn a simple drug store cosmetic bag into a personalized and thoughtful gift! 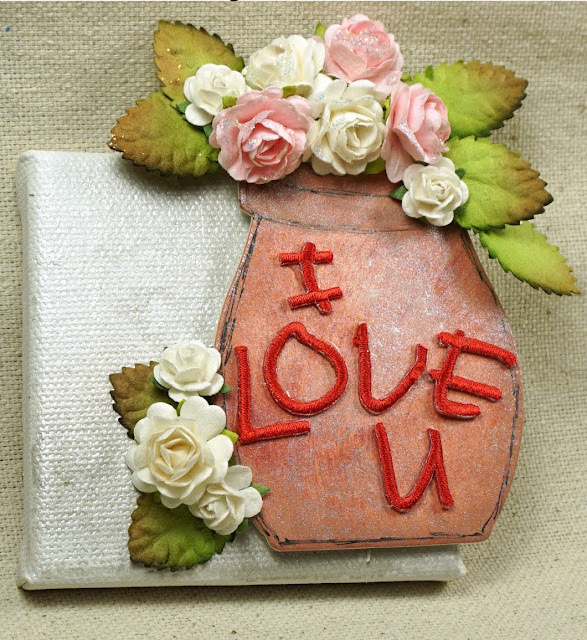 Just glue on your girl's initials and embellish with a couple of fabric flowers. Throw in some travel-size beauty items like body wash, lotion, and perfume - plus some gum and you have a lovely (and inexpensive!) gift that any girl is sure to love. After all the holiday decorations come down, I like to redecorate the house with a winter theme. Even though I may not like the cold winter months, I still find beauty in a blanket of newly fallen snow. Squirt a small bit of white paint on a piece of scrap paper. Lightly apply paint to the bristles of an old toothbrush and wipe excess paint off. Gently flick the brush to spray paint over the canvas. 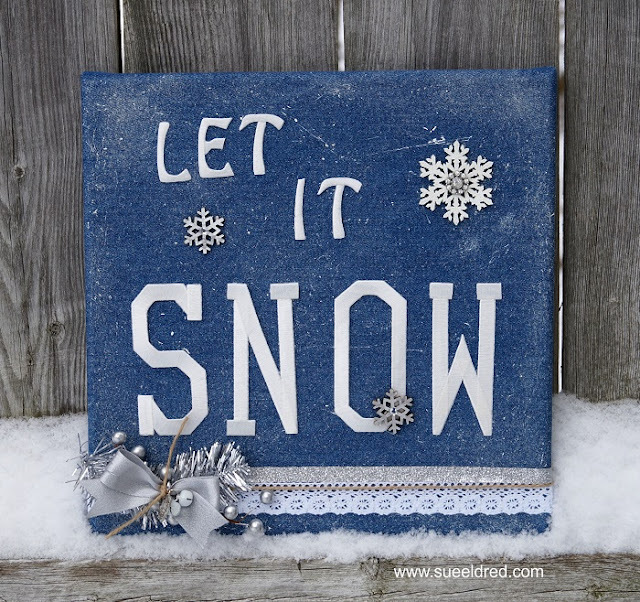 Glue the letters and snowflakes to the canvas. Glue lace and ribbon to the canvas, wrapping and gluing ends around to the back. 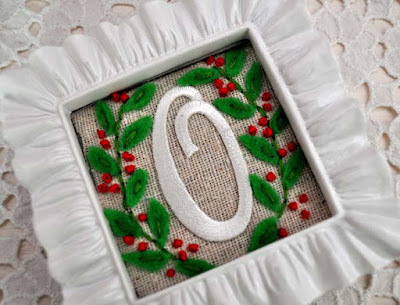 Tie the silver berries and greenery together with a jingle bell and satin ribbon, then glue to the bottom corner of the canvas.